Oh, SCORE!!! Ma said it was a beetle, but I just think it's FUN! So Ma got a paper towel (chicken liver Ma didn't want to touch the scary, scary beetle with her bare hands!!) That's when I heard the all familiar *screech*!! Yup, this is the face she made.....again! Why? Well, apparently I didn't deaded it after all!! Ruby, The Great, Good, Adequate, Meager Beetle Huntress. Oh fur goodness sakes, don't your Ma knows dat Beetles is good to eat? They is all nice and crunchy and loaded withs protein. Personally, I likes da crunchy sound they makes and then their guts kinda spurt out between your teefs. But, my mum is like your Ma, hers would NEVER EVERS touch a bug with her bare hands or hers would throw up...BLAH! Anyways, I likes your new moves, I is gonna try those out. No worries I bet you will catch and deaded the beetle next time!!! By the way, my assistant screeched when she saw that scary possum!! Ruby, that was a good one, the old fake deaded beetle move on Mommy! I love it. That possum looks good, can you dead that and tag it and bag it for me?? Ruby... I am with Sasha on this one... THAT was a grrrreat trick to play on your mum. It is just what she deserved fur not wantin you to get to EAT and SAVOR your Prized Treasure. Tisk Tisk on HER... HOOOOOORay fur YOU! Hmm, hopefully there will be lots more things to work on your deaded skills with! Hey, dat is no fairs, if you even almost deaded it you should be ables to eats it! OH! That is a great trick to pull. I think I'll try it sometime. 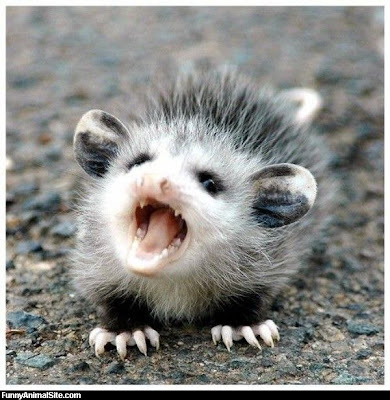 Hey, did you take a pic of my opossum before it's untimely meeting with its Maker? I wonder why our moms are so afraid of those little creatures! I would have called it dinner or at least a snack. I think beatles have more than one life. It just needed to be deaded again. Love the face your mom made. Bawhahhahha. I've never caught a beetle but I love to catch crickets. They are such fun because they jump so high. My mum doesn't like to touch bugs either. When Floyd was a little tiny pupper (before I joined the family) he digged up and deaded a grub from the lawn. He eatted it befur the humans could stop him. They say it must have been the tastiest grub in the whole WORLD because fur days he would return to that spot in the lawn and looks fur more to dead!! BOL!! Try slobbering on it, Ruby. I drown stuff in my drool! Hi Ruby we are certainly glad you and mom worked together to deaded that Japanese beetle...they are quite destructive to bushes and flowers. Ruby, have you read the latest?! You won't believe the way the story has twisted!!! You are a hoot! We like it when you make your mom ekkkkeeeeekkkk scream. BOL! great job ruby!! too bad you couldn't eat it. BOL! our mom doesnt even touch stuff like that with a paper towel, she kicks it away with her foot.